Gemstone Wire Wrapped Pyrite Rosary Chain. 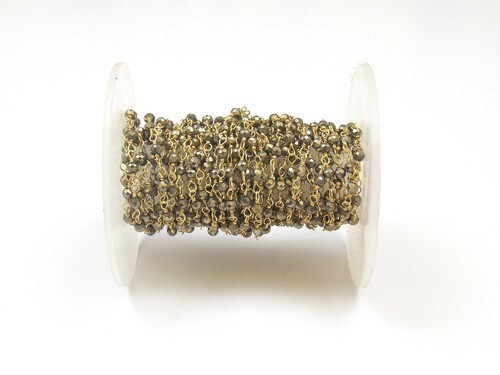 We are one of the leading manufacturer and supplier of Pyrite rosary chain. We obligated to meet the quality standards as per the customer demand. Situated at Jaipur (Rajasthan, India), We “Sameer Art & Craft”, are a Sole Proprietorship firm, engaged in Manufacturing, Wholesaling, and Exporting of the finest quality array of Gemstone Connectors, Bezel Connector, Beaded Rosary Chains, Arrowhead Pendant, Imitation Ring, Semi Precious Bezel Connectors etc. Under the leadership of, “Mr. Mohammad Rafiq” (Owner), we have been able to cater to bulk necessities of patrons in an efficient manner. And during the production process, the experienced designers & Q.C staff of our firm properly follow international market trends and advanced designing methods in order to come up with excellent results. We ensure that all our products will have a touch of elegance and possess flawless designing. Our offered products are highly appreciated for their sheen, fine finishing, perfect polishing, attractive shaping, and durability. We will do our best effort to produce a worthy result for your given order, so that we can have the repeat order which helps us, to develop a long-term relations ship with our customers. We export our products worldwide.